Textile House: Let your voice be heard. Election day is here and I'm concerned. Actually, I'm always concerned when election days roll around. I'm concerned that women will throw away a right that was fought for so passionately. 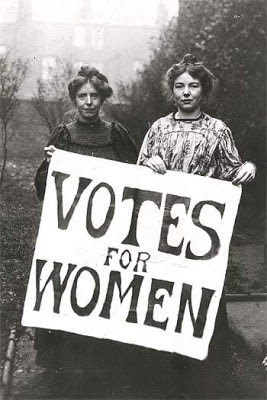 I'm always concerned that less than 100 years after earning the right to vote, we, as women, will take it for granted and decide we are too busy to stop at the voting booth. I believe it is my duty to show that I appreciate what the women that fought for these rights did for us. That I respect their sacrifice. These women that were chastised, humiliated and at times incarcerated for seeking a voice in their future. For fighting to give me a voice in mine. Something that was given without thought to men. Something that in many countries women still go without. I vote because so many stood up and said, no more. I owe them the time to go and vote. Today we, as women, still fight for equal rights. We are still shut out of many opportunities. Let's not lose ground by staying home and letting others decide our future. I don't care who you vote for. I don't care what your ideology is. What I do care is that you go out there today (if you have not done so already) and cast your ballot. Be part of the process. Let your voice be heard. 5 comments on "Let your voice be heard." It's a good thing! I really enjoyed the coverage of the voting last night... and especially how they were giving percentages of the women's votes. 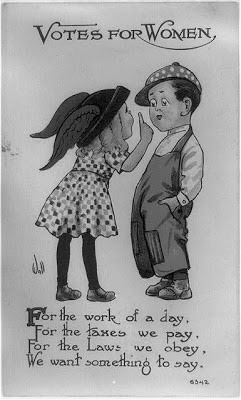 We have come a long way since the Suffrage of 1920. I would let my grandma down if I didn't vote!